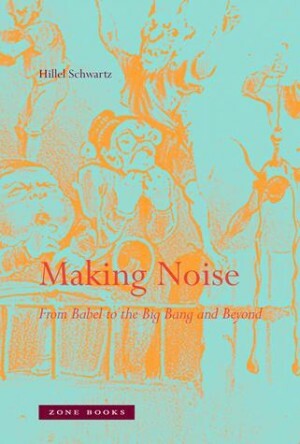 Hillel Schwartz’s 2011 history of noise, Making Noise: From Babel to the Big Bang and Beyond, offers—through more than 900 pages of sonorous, often punning prose—nothing less than what the titles of its three main “rounds” suggest: a history of sound “everywhere,” “everywhen/everyone” and “everyhow.” In this review, however, I will examine the book’s 349 pages of endnotes, entitled “Reverb: Notes,” that, because of printing costs, could not be included with the published text. Instead, they are available as an online PDF from Zone Books. This basic rupture between text and end-text indicates, in my reading, that the notes can function not merely as an educational supplement by which “assiduous readers” might check up on Schwartz but also as a work worth seeing and reading on its own terms. As the reverberating continuation of the “main” text, “Reverb: Notes” collects, curates, archives, and arrays the citational substrate of Making Noise. However, it also presents an implicit argument about the poetics of scholarship, the task of the historian, and the power of noise. The endnotes, in other words, have a logic of their own that simultaneously borrows from and exceeds the genre of scholarly investigation. I hear the endnotes as an epic poem—in Ezra Pound’s sense of “a poem containing history”—that must be reckoned with not in the guise of a mellifluous lyricism (the style at work in the main text of Making Noise) but rather as an exhausting performance of indexicality. Severed from simple bibliographic reference, “Reverb: Notes” plays upon the force of the index as both a function and a figure. Simultaneously a veiling and a revealing, “Reverb: Notes” searches for and finds noise within our contemporary culture of search and research. Terse, simple, direct: however, it is interesting to note that the rules for reducing the length and repetitiveness of the endnotes imagine the limitations of space that a codex demands, so we continue to use these notes as if they were part of a physical book. The reference to the codex as a form, and the miming of that form within the “digitized” end-text, paradoxically engenders a form of reading against the discontinuous and repetitive procedure that note-checking typically involves. That is to say, rather than skipping from page to page, from text to note, one finger on page 154 and another on page 356, rather than the notes strictly following the itinerary of the “main” text, we can read—and are asked to read—these notes as if they were a continuous work, an itinerary of dislocation within a system of listings that proceed number by number, entry by entry, for 349 pages. From volcanoes to the deafening noise of battle via poetry… In this example note, we can follow the itinerary of the main text, but we also have the benefit of more information (the Volcanic Explosivity Index), exact page numbers (99, 104, 110-11, 133, 150), and a correction of Byron’s view of the Battle of Waterloo. While the style of Making Noise sets up a mimetic poetics in which the language of history mimics the continuous discontinuities of noise as a human invention, the poetics of “Reverb: Notes” reduces reading to abstraction. The abstract tokens of structure, number, and punctuation blend with the texts of titles, names, and places; semi-colons, commas, and colons then suture these textual elements in clipped, broken, and yet static rhythms. This abstract poetics—a whole system for navigating information inside and outside the text—falls out from the demand that endnotes exhibit a fidelity of text to text. Rather than what one might consider a “vertical” connection between concept and style (Alexander Pope’s dictum that “the sound must seem an echo to the sense”), we have the “horizontal” connection of citation to citation, number to number. Language becomes an index to more language, not the privileged site for a listening experience. And yet, the end-text does not simply index the array of books that make the language games of the main text possible. It overwhelms the contained genre of the scholarly endnote and points to a range of excesses that illuminate the historical and phenomenological problem of noise. We initially feel these counter-acting effects in the sheer weight of information. Here, the “grunt work” of history is laid bare. All the standard procedures of citation are there but in hypertrophied form. Each numbered paragraph of citation after citation produces a complex of effects: 1.) a proper citation indexing a source, 2.) a set of keywords or an abstract logic connecting the citations within the paragraph (we might call this, after Pound, an “ideogram”), 3.) an act of historical reconstruction (the historian sifting, examining, and aligning texts to make an argument), and 4.) a kind of stubborn durational performance (we can almost hear the historian grunting as he compiles and piles text after text of historical, theoretical and cultural documentation). Seen through this complex, Schwartz’s narrative becomes itself merely an after-effect, a belated suturing of the poet-historian’s painstaking collection of the “word-horde.” This heaped up language precedes the textual “hearing out” of noise (Making Noise 17). The “main” text reveals itself only by veiling its reverberating “end”-text. Making Noise thus follows a fantasy of inductive method that the collection of citations projects. It is a summation of a vast number of subjects, objects, theories, and documents. In a way, Schwartz has enacted a cultural symptom detected by the poet Kenneth Goldsmith: “The act of listening has now become the act of archiving. We’re more interested in accumulation and preservation than we are in what is being collected….Our task is to simply mind the machines.” (“I Love Speech” 288-289). But Schwartz is very much interested in what is being collected—noise. These notes toward noise are not only a portrayal of the work of doing history but also an argument for the density and ubiquity of noise: noise is “everywhere” and “everywhen.” As such, a metonymic logic structures the enormous number of texts on display in “Reverb: Notes.” They figure a “beyond” that exists outside of the very set of phenomena that they enumerate. These are notes as “notes toward.” That is to say: just as “Reverb: Notes” is formatted as an outside—a mere “reverberation”—of the main text, it also produces a kind of indexical arrow (à) pointing to another “outside:” a noisy infinity uncontained by the logics of sequence, change, cause and effect that structure historical argument. What Schwartz constructs in the endnotes is a version of historicity conditioned by this paradoxical anti-phenomenonality of noise: how does one listen to the unlistenable, how does it enter into history? The answer lies, at least partly, in the archival art of accumulation and the rhetorical art of naming. Where and when does one find documentary illustration of a phenomenon named noise? Everywhere and everywhen: from religious books to scientific treatises, from travel writing to philosophical tracts, from environmentalist literature to war machines. The art of acquiring everything—or at least seeming to acquire everything—allows the historian to ride the centrifugal force of noise: to displace it even as one discovers its meanings. Noise remains an empty indication, even as testimony after testimony names its forms and functions. And so “Reverb: Notes” becomes, in the name of noise, a somewhat dedifferentiated mass of documentary sediment. What a combination of fantasy and historical imagination! Schwartz takes it up. The history of noise must contend with a latent history of everything, archived everywhere, in book, land, sea, and air. Noise, existing at the edge of phenomena, makes this grand, all-encompassing claim, and so Schwartz feverishly collects texts in a way that parallels Babbage’s impossibly remote archive in the air. From “C. Mackenzie Brown, “‘Purâna as scripture: from sound to image of the holy word in Hindu tradition,’ H of Religions 26 (1986) 68–86” to “Monica A. Harris, illus. Susan Estelle Kwas, Wake the Dead (NY: Walker, 2004),” from “om” to death, “Reverb: Notes,” simulates the “all-encompassing” and mimes “every” route by which noise can emanate from history and history can emanate from noise. At the same time, the notes present the exhaustion of such an “exhaustive” account of noise. We are given an apparatus of reference and cross-reference that undoes any totality that might begin to accumulate. Douglas Kahn has called noise the “continuous grating sound between the abstract and the empirical” (25), and “Reverb: Notes” continuously measures this distance between categorical expectation and particular result. The metonymic figuration of noise remains always tantalizingly partial: this sound or this action produces noise within such and such parameters of listening. Specific sound-shapes, durations, concepts and contexts can manifest and appear within the untotalizable shadow of noise. And so every entry in “Reverb: Notes” also predicates specific events, concepts, opinions, myths, sounds, etc.—all potential ways into a shifting phenomenology of perception that could search for, find out, and cite noise. Scale matters here in a different way: it is not only that the overwhelming weight of these many citations metonymizes “everything” but also that the necessity to specify more and more areas of research and zones of concrete detail increases the sheer number of sources, accounts, and categories. There is a difference between 80 and 800 pages that highlights the failure of figuring noise as any one thing—even as an “anti-phenomenon,” the figure of the unfigurable. “Reverb: Notes” shows, then, both the dream and the nightmare of the exhaustive account. An inspired edifice to both the historian’s task and his chosen subject, the endnotes both exalt in and cast doubt upon the exhaustingly partial world in which we live. A paean to hypermediation and information overload, “Reverb: Notes” also expresses the joys of failure in a world in which everything can (supposedly) be archived, preserved, and stored for future use. Noise, as an elemental turbulence and disruption that simultaneously nestles within and escapes this thick citation-world, reveals an unmaking at the heart of making, a way out of the weighty address by which 349 pages of citation can call up an endless cycle of reference and deferral, and a way into a particular history that can dream meaningless duration and irreducible complexity. Babbage, Charles. The Ninth Bridgewater Treatise. London: John Murray, 1838. Print. Goldsmith, Kenneth. “I Love Speech.” The Sound of Poetry / Poetry of Sound. Ed. Craig Dworkin and Marjorie Perloff. Chicago: University of Chicago Press, 2009. Print. Hall, Donald. “Ezra Pound, The Art of Poetry No. 5.” The Paris Review. No. 28 (Summer-Fall 1962). Print. Kahn, Douglas. Noise Water Meat. Cambridge: MIT Press, 1999. Print. Robertson, Lisa. Nilling. Toronto: Bookthug, 2012. Print. Serres, Michel. Genesis. Tr. Geneviève James and James Nielson. Ann Arbor: University of Michigan Press, 1997. Print. John Melillo is an assistant professor in the English Department at the University of Arizona. His book project is entitled Outside In: Noisescapes from Dada to Punk. He also makes noise under the name Algae & Tentacles.